How to design events that make families feel welcome and build on the rich cultural assets they bring to schools. Visiting families' homes can connect teachers to students' histories, needs, and strengths. Tightened immigration policies and uncertainty are creating a "silent crisis" for students from immigrant families. Educators' response matters. To tap parents' knowledge and support, an alternative high school program created new opportunities for communication. A noted advocate for meaningful school-family partnerships discusses how to get beyond "random acts of parent involvement." A sociologist says educators need to understand complex family structures while celebrating common values. To best serve students with special needs, honor the collective wisdom of both parents and educators. New research shows that frequent, personalized outreach to parents works. How can schools support the practice? Can Parent-Teacher Groups Work for All Students? The 176-year history of parent-teacher organizations is complex—and entirely relevant to today's schools. A focus on deficits hurts both students and their families. We need to build families up—especially now. A personal reflection on how schools can better partner with immigrant families. Parent involvement starts with powerful everyday messages. How one school treats each new student as a valued learner from day one. Watch the video. Digitally savvy practices to keep parents engaged and informed. For good communication with parents, plan, practice, and plan more. To support diverse students, know their communities. When educators and parents establish shared intentions, everyone benefits. Early literacy practices in some libraries offer takeaways for educators about how to engage parents. Churches can be both models of hospitality and valuable community partners. 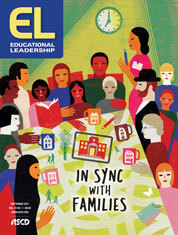 Accomplished educators share their ideas for building better relationships with students' families. Essential questions and discussion prompts for this month's issue.